Pulham St Mary the Virgin had three postmills working in the 1800s - a northern mill, a western_mill and a southern_mill. 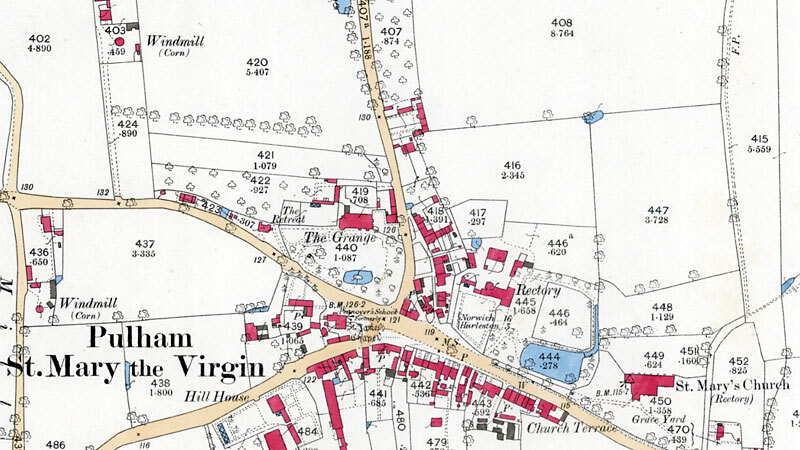 Nearby was the larger village of Pulham Market that was also known as Pulham St Mary Magdalene in the 1800s. Up until at least 1871 the mill was powering two pairs of French burr stones. HARLESTON. SHOCKING ACCIDENT.—On Tuesday last, shocking accident occurred to Mr. Stanton, miller, of Pulham, who was in the act of adjusting some part of the machinery of the mill, when his right hand became entangled in the cog work, and was crushed to pieces. Mr Mills, surgeon, was very quickly on the spot, who considering it prudent to have further assistance, a messenger was sent to Harleston. Mr Bunn and Mr Candler shortly arrived, and it was decide that amputation should immediately take place, which was at once performed by Mr Mills. Mr Stanton remains in a very weak state, but hopes are entertained of his recovery. John Caley Is favoured with instructions from several Proprietors to Sell by Auction at the Crown Inn, Pulham on Monday June 30, 1862 at 5 o'c In Eleven Lots. At Pulham St. Mary the Virgin. Lot 5. A compact WINDMILL driving two pairs of Stones and going gear complete and a capital Dwelling house formerly in three tenements with detached Offices, Workshop, Piggery, Stable, Cart shed, and Granary and an Inclosure of first class PASTURE LAND. 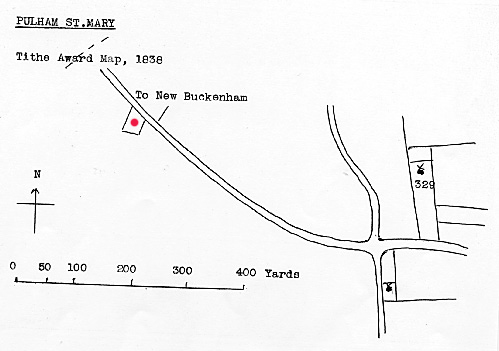 This property is well situated near the Street at Pulham St. Mary the Virgin and is in the occupation of Mr. Charles Hood. The Mill is in full trade and from its position will always command a large share of profitable business. Apply to the Auctioneers or Messrs. Hazard, Solrs. Harleston. WANTED, A Single Man to take charge of a Windmill. Apply G. Hood, Pulham, Norfolk. SALE, three New FRENCH BURR MILL-STONES, one 4 ft. 4 in. and one pair 4 ft. 6 in. Apply Charles Hood, Miller, Pulham Mary, Harleston. FOR SALE Two Pairs of new French BURR STONES, one pair 4 ft. and the other 4 ft. 4 in. Accident. - On Tuesday a serious accident befell a young man named Youell, in the employ of Mr. G. Hood, miller. Youell was standing on the cart near the mill , which was in motion, when one of the sails caught him the head, causing scalp wound, from which blood flowed very freely He was conveyed to Dr. Paulley's, who promptly attended to the unfortunate man's injuries. The patient is progressing favourably.